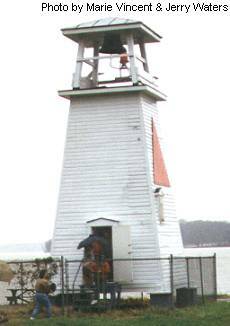 This light station was established in 1857 and at first it was nothing more than an 18.5 foot iron pole with a light that could be hoisted to the top in the evenings. In By 1869 there had been many complaints about the light and the Lighthouse Board ordered a new tower constructed that was placed in February of 1870. In 1882 the present bell tower was erected. In 1883 permission was granted by the Secretary of War to build a keepers house close to the light and the bell tower at the base of the Fort. The house was finally completed in 1885. By 1900 the Army had build a pier and other structures along the shore line blocking the view of the light from the water. About 1900 the Lighthouse Board asked for an additional $1,600 to construct a new tower but no money was forthcoming. In 1901 they modified the bell tower to support the additional weight of the lens and moved the light to the top of the bell tower as it is today. The light is 28 feet above the water. Located in Fort Washington Park which is managed by the National Park Service. Go South on Route 210 (Indian Head Highway) for 6,3 miles to the intersection with Fort Washington Road. Turn right onto Fort Washington Road. There is a sign directing you to turn here for Fort Washington National Park. Stay on Fort Washington Road and go two and a half miles to the park entrance. The park is open daily from dawn to dusk. The lighthouse is off the main loop road (the first turn past the first parking lot). Take this right turn and wind down to the river. There is a parking area at the end of the road and then you have to walk the last few 100 yards to the light.